The Osage Ballet will hold a special, one-evening performance of Wahzhazhe, an Osage Ballet, on Sept. 8 at the Leach Theatre in Rolla, Mo., at 7:30 p.m. The Leach Theatre, where the Osage Ballet will perform on the evening of Sept. 8, is located at 400 W. 10th Street, 103 Castleman Hall in Rolla, Mo. For tickets, contact the box office at 573-341-4219 or leach@mst.edu. 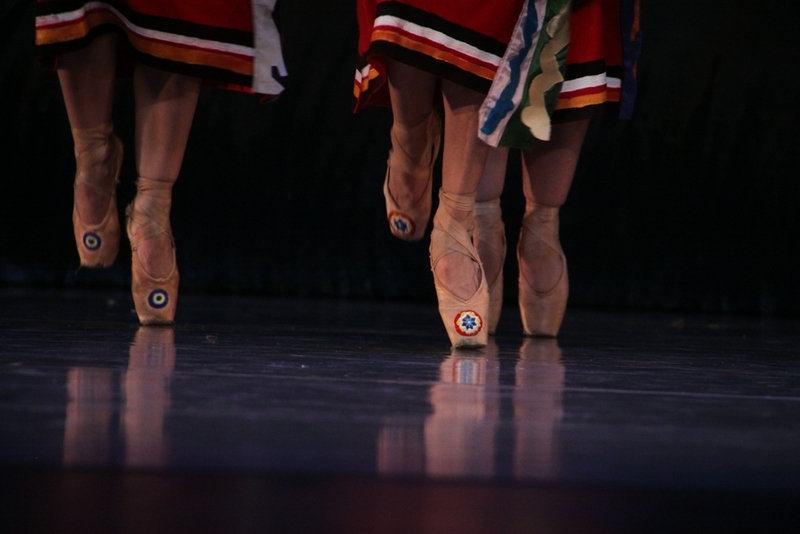 This ballet derives its name from the actual name of the Osage people in their language – Wahzhazhe. French explorers befriended the Osage and when writing about them in their language “w” is written as “ou.” However, when the English read French texts, they mispronounced Wahzhazhe as Osage, Director Randy Tinker Smith said. Wahzhazhe, an Osage Ballet shares of the story of the Osage people through the artistic medium of ballet in the tradition of the late Osage prima ballerina Maria Tallchief, and her sister, ballerina Marjorie Tallchief. The following day, Sept. 9, at 10:30 a.m., Osage Nation Principal Chief Geoffrey StandingBear, members of the Osage Ballet company, and the greater community, will gather for the unveiling of a bronze sculpture of an Osage family, at the intersection of State Hwy. 19 and Interstate I-44, in Cuba, Mo. The sculpture, a project of the City of Cuba, Mo., celebrates the history and legacy of the Osage Nation. The project was overseen by Cuba artist, Glen Tutterrow, and features an Osage warrior in period-speciﬁc dress followed on the trail by his family. According to Osage Ballet Director, Randy Tinker Smith, this sculpture is the first monument to the Osage people in the state of Missouri. The sculpture depicts an Osage family traveling westward along the Osage Trail. After numerous removals, the Osage people purchased land in Northeast Oklahoma, where many Osage still reside, known as the Osage Reservation, sharing the same geographical boundaries as Osage County, Smith said. The bronze sculpture will stand 35 feet tall, 20 feet wide, and 80 feet in length. The sculpture is designed to work with the contours of the site. There are plans to include working water features, native plant landscaping and lighting for evening viewing opportunities. The 35-foot height will allow interstate drivers to see the sculpture from the city limit boundaries, from both east and west. Since 2012, the Osage Ballet, organized as a non-profit 501(c)3 organization, has performed Wahzhazhe, an Osage Ballet, at prestigious venues such as the Tulsa Performing Arts Center, The Smithsonian Institute’s National Museum of the American Indian, the International Festival of Families in Philadelphia during the Pope’s visit to the U.S., the Coleman Theater in Miami, Okla., and most recently at the Lensic Theater in Santa Fe. To learn more about the Osage Ballet, or to make a donation, visit their website: http://www.osageballet.com and watch for posts on the Osage Ballet Facebook page.